Fabulous Modern Minimalist Home Design. We have had a design love affair with the modern minimal look for quite some time now. 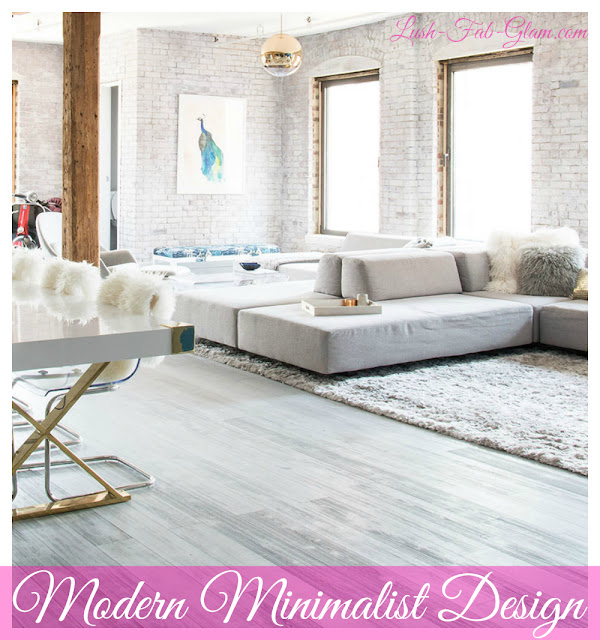 Modern Minimalist home design is light, bright, airy and captivating while creating a sense of rest and relaxation. We especially love that it exudes timeless elegance without being over done or fussy. 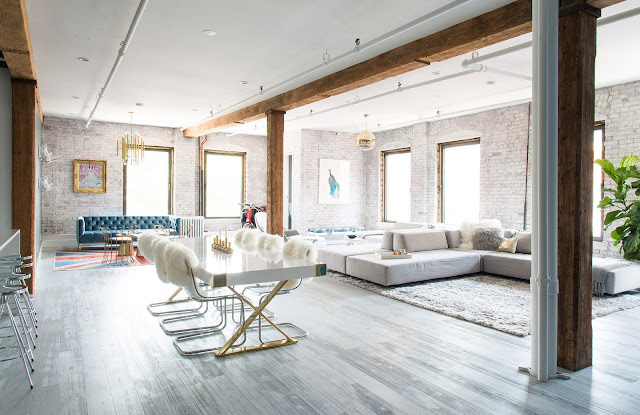 Read on to see photos from inside a stunning Brooklyn Loft that perfectly captures the modern minimalist design style and see our fab tips to help you master this design style in your own space. Modern Minimalist dining and living rooms. 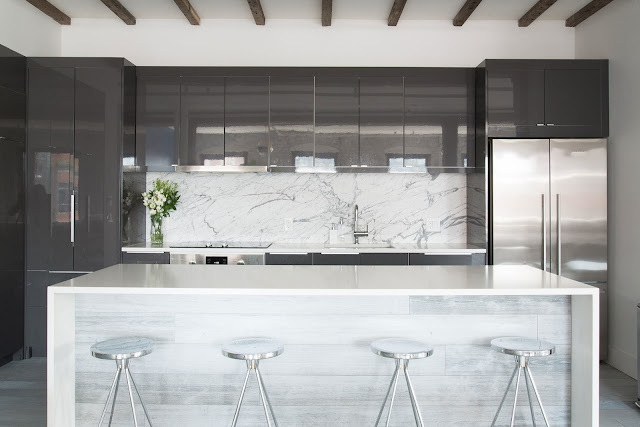 The use of design elements like dark cupboards, ground the otherwise neutral space with it's grey-washed floors, light brick walls, chrome bar stools, white marble back-splash, transparent dining chairs and neutral furniture. Make the space cozy and inviting with faux fur pillows, which add rich texture to the space. Everything from the lighting, gold base of the dining table, gold throw pillow and the painting framed in gold help to warm the space by mixing metals which is another popular design trend right now. The natural wood beams also add an eye-catching sense of warmth to the otherwise open space. Make the space feel like home by infusing your personality into the décor with subtle but refreshing pops of color. An easy way to do this is through wall décor like photos and paintings or by adding a colorful rug, patterned fabric ottoman or chair which also provides extra seating. Capture the blissful and relaxed mood that you feel when spending time in nature by adding greenery to your home. You can make a statement with the oh so popular fiddle leaf fig tree. Get more home design inspiration in our "Beautiful In White Home Decor" and "Minimal Chic Home Design" articles.